The L.D.S. Articles of faith shown in error contrasted with the truth of the Bible. Today we are going to look at the Latter Day Saint’s Articles of Faith, written by their prophet Joseph Smith, to see how it conflicts with Orthodox Christianity. It is important to note how they use the same words we do, but define them very differently. The first one seems alright until you ask them to define their terms, then we see the vast chasm that separates them from the true faith. Their father was once a man named Elohim (which is amusing because Elohim is the Hebrew word for god) This man followed the doctrines of the LDS faith so well that he became an exalted man, then the god who rules this solar system. According to the LDS faith, he has a flesh and bone body and is a caucasian. When they say he is eternal they only mean that he was part of the eternal energy and intellect. They only believe that matter and intellect are eternal. They believe that Elohim was the son of his parents as they were children of their parents and so on approaching infinity. In that sense, they call him eternal. They believe that Jesus is actually his son through sexual copulation and that the holy spirit is simple the spirit of the father. They deny man’s inherited sin nature in Adam, conflicting with what the Bible says in 1 Corinthians 15 as Adam being our federal head. Denial of total depravity also helps them justify other abhorrent beliefs. Again this sounds good until you find out what they believe about Jesus, the gospel, faith, repentance, baptism and the laying on of hands. I’ve already explained that their jesus is a created being who is not God. Their gospel is a list of works and doctrines that must be obeyed so it is no good news at all. Read their book, “Doctrines and Covenants” if you want to understand what they call the gospel. The Christian gospel, εὐαγγέλιον-euangelion, or good message is one of salvation by grace, not adherence to a moral code written by a false prophet. Their repentance is not the repentance that leads to life, because theirs is the one that leaves them dead. They have a works righteous repentance where they admit wrongdoing and attempt in their own dead flesh to not do it again. As we know the repentance that leads to life is actually the repentance of their type of repentance. 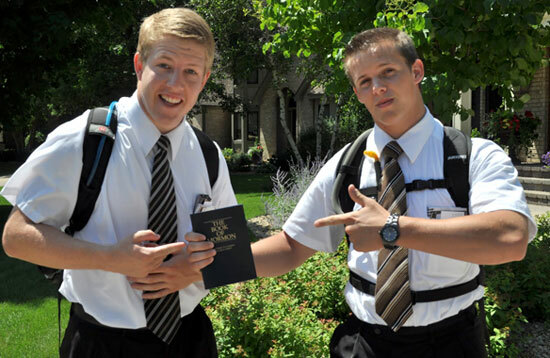 For someone to truly be LDS they must be baptised into the cult. It is a necessity. In Christianity baptismal regeneration is a heresy. They believe in apostolic succession. This is also a false teaching. We know there are no more Apostles in the same sense as the ones who were with the incarnate Christ and sent by Him to build the Church upon Him as the rock. We also know that the Holy Spirit indwells all regenerate believers. This also sounds good until you understand what they mean. Their god can call nobody, because he doesn’t exist. Their god is a fictional character imagined by Joseph Smith. The only people who can be leaders in their cult are those who have been approved by the men who have already been firmly entrenched into their cult. Smith uses the phrase, “so forth” without being specific about other offices they affirm. It is almost as if he was just too lazy and didn’t want to look into it. Again he is using words that are in the Bible and redefining them. One who is sent with a message is an apostle according to the Bible in a sense all Christians are apostles. We are not Apostles in the sense of, “The Apostles.” A person who declares the reality of what God says as actual truth is a Prophet. Prophets who declared portions of God’s word that had not occurred yet are not predicting the future like a fortune teller. If God says something is going to happen it has already happened we just haven’t gotten that far down the timeline yet. Modern Prophets are just reading the Bible out loud. We have the complete word of God given to us in the Bible, there is no more to come. Jesus perfectly fulfilled the role of Prophet, as He is the Word made flesh. Of course they affirm all sorts of extra-biblical revelation. It is the only way they can justify believing the lies of Joseph Smith and all of the other false prophets of their faith. The LDS are continuationists in the extreme sense. They don’t just believe in continued miracle healings like our charismatic brother, but exceed that of acceptable doctrine by preaching extra-biblical revelations and more revealed truths that supercede and abrogate the word of God that we have. That’s right, you read it correctly, Joseph Smith wrote there were only 10 tribes. What happened to the other 2? They believe that there were 10 lost Hebrew tribes that fled to America in antiquity. They also believe that ‘Merica! is going to be where the New Jerusalem will be… Come on? Really? I know, I know, it baffles the mind, but this is what they believe. When you are a false prophet you can say just about anything even stuff that is flat out fiction. This is a pretty relativistic statement in practice. It sounds innocuous enough to be non-threatening, but if they truly believe this why do they send out missionaries? Interesting that there is no clause to disobey the government when it is compelling the people to disobey God. The Bible is pretty clear that we stop obeying the government when it tells us to disobey God. Like their 11th article it is a product of the time. During this period in American history mormons were seen as a dangerous cult. They were forced out of cities and towns as they followed their outlaw leaders who were horse thieves, and crooks. They were not well liked or respected due to their insane beliefs and practices. Joseph Smith attempts to tie it all up here and put a pretty spin on things, but let’s see what they really pursued, polygamy, false prophecies that never came true, false prophets whose prophecies they built their faith on, immoral ceremonial practices, oh oh and, “So forth” (I’m kidding, I won’t do to you what Joseph Smith did to you) works righteousness in a graceless man-centered system, they have believed the lie instead of the truth, a false jesus who is a creation and can not save from sin, and a god who is not eternal. A Review of No-Mes Fingernail Clippers, American Made by Industrial Tool and Die Co. Inc. Happy Labor Day!